LumiQuest's Wedding/Event Kit offers two of the most popular LumiQuest light modifier products that are especially valuable for shooting weddings and other events. 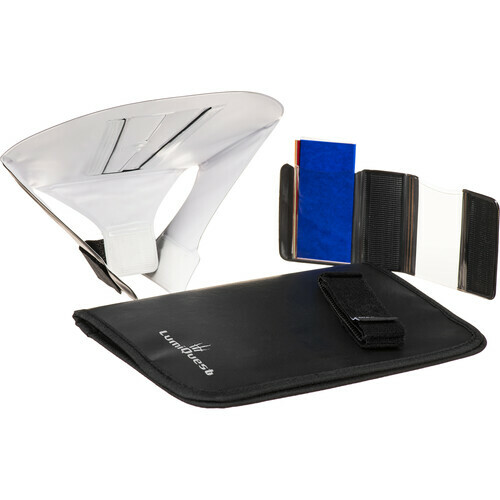 This kit includes the Quik Bounce flash modifier, the FXtra compact gel holder with 8 color gels, and one UltraStrap, a secure non-adhesive mounting strap, all in a convenient storage wallet. When you're shooting a fluid, fast-moving event like a wedding this kit will help you keep up. The Quik Bounce is designed for use with or without an appropriate ceiling off which you can bounce light. It has doors that can be opened to allow 80° of the light to bounce off the ceiling and 20° to be directed forward to fill shadows caused by the top light. With the door closed, 100° of the light is directed forward. The FXtra is a gel holder with 8 gels, including gels for balancing your strobe with incandescent and fluorescent light, plus red, blue, and yellow special effects gels. In addition, one UltraStrap is included for attaching an accessory to your flash--the UltraStrap applies a constant 3 lb of pressure to the flash for a secure fit. Box Dimensions (LxWxH) 9.0 x 6.5 x 1.1"
Wedding/Event Kit is rated 5.0 out of 5 by 2. Rated 5 out of 5 by dwphoto from Great product, very adaptable - Easy to setup and use - The reason why I purchased this modifier, is because I can use it both in portrait and landscape mode and still get proper flash fill. As the flash is rotated 90 degrees. So when you switch between portrait and landscape the flash / modifier remain upright. Rather than sitting on the side as it would if you were using any other modifier with the flash in it's standard angle. It's a little hard to explain, but if you look closely at the product, you'll understand... Good size too.